This entertaining and erudite book deserves to be read by anyone who, like myself, has ever felt a thrill of adventure from seeing the Treasure Island type maps so beloved of Hollywood films. Such scrolls are always adorned with fearsome illustrations of sea monsters, lurking just offshore to deter the faint-hearted and gullible. It’s true that early charts did include a myriad of sea monsters but, as with so much in popular fiction, there’s a kernel of truth to the media portrayal – but it’s not what you might expect. The key revelation from this book for me was that the majority of maps intended for use in navigation did not include sea monsters, and the reason was simply one of economics; drawings were an optional upgrade. You can imagine the scene: A cartographer stands in the heavily gilded drawing room of a prestigious client. The shiny mahogany table is littered with papers and scrolls, rolled and unrolled. “This,” he says pointing to an unadorned chart of the Indian Ocean, “is undoubtedly the work of expert craftsmen, but…” With a flourish he produces a copy of the same location, this time with fantastical creatures, boats and scroll-work labelling across the expanse of the ocean: “..this is a work of art, fit to be owned by a scholar such as yourself.” This then is the secret of the survival of these documents; they were often ‘coffee table’ items, intended to impress the friends and acquaintances of those wealthy enough to commission them. Sea Monsters on Medieval and Renaissance Maps is laid out roughly chronologically, starting with classical precursors, the earliest medieval charts through to the end of the Renaissance in the sixteenth century. However, this is by no means a dry indigestible tome, there’s a light and humorous treatment of the subject which is immensely engaging. There are chapters with titles such as ‘Sea Monsters on the Ceiling’, ‘How to Buy a Sea Monster’ and ‘The Curious Career of the Flying Turtle’. The latter section is one of my favourite snippets: It was common practice for creatures to be copied by artists from earlier designs. The flying turtle first appears on a map of 1558 and was published by Arnold Nicolai at the ‘sign of the turtle’. From this the turtle is taken to subtly identify Nicolai as the cartographer. It was then duly copied by other cartographers in 1564, 1597 and 1590, all of whom were unknowingly copying the logo of a competitor! Any title which deals with illustrations is inevitably going to be judged on the quality of its own art work. In this, ‘Sea Monsters’ triumphs. It is sumptuously and generously illustrated throughout, with almost every page holding exquisite colour reproductions of the pictures being discussed. The paper quality is highly glossy, and the publishers have gone so far as to include flaps on the end pages as handy book marks. As someone who regularly sees Archaeology books at two or three times this cost, it’s astounding that the British Library have manged to produce this for the cover price of £14.99. Chet Van Duzer is clearly an expert in his field, being an Invited Research Scholar at the John Carter Brown Library in Providence, Rhode Island and having previously produced the first detailed analysis of the earliest surviving terrestrial globes of the New World. But more than this, perhaps due to his impressive catalogue of journal publications, he is someone who is able to impart his knowledge in a way that is fun and easy to read. 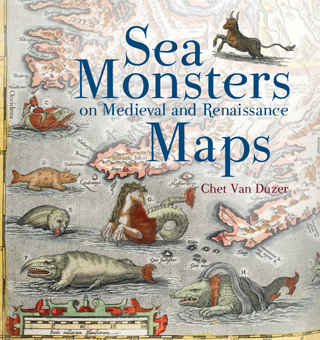 That said, Sea Monsters on Medieval and Renaissance Maps isn’t the snappiest of titles. I can’t help feeling that it would have had greater mass market appeal if it were called something with an exclamation mark after it, such as Monstrous Maps! But perhaps that would undermine its academic appeal. Whatever, I’d certainly recommend this to armchair adventurers everywhere.